On October 7th, I happened to be traveling along Druck Valley Road in York, PA. I spotted a man on scaffolding, chainsawing a tree. I slowed down and noted the advertising on his truck. I didn’t have a “set” schedule for the day, so I turned around and went back. When I climbed out of my car, he stopped sawing and took off his earphones. I told him my name and why I was interrupting his carving and he was happy to take a break. “Really, they give you an idea and you just run with it? Do you sketch it out with the client?” I asked. “No” he answered, shaking his head. “I don’t sketch anything.” Then he pointed to his head with his finger. “It’s all up here.” he grinned. I was very surprised and impressed. I needed my camera and lucky me had it. 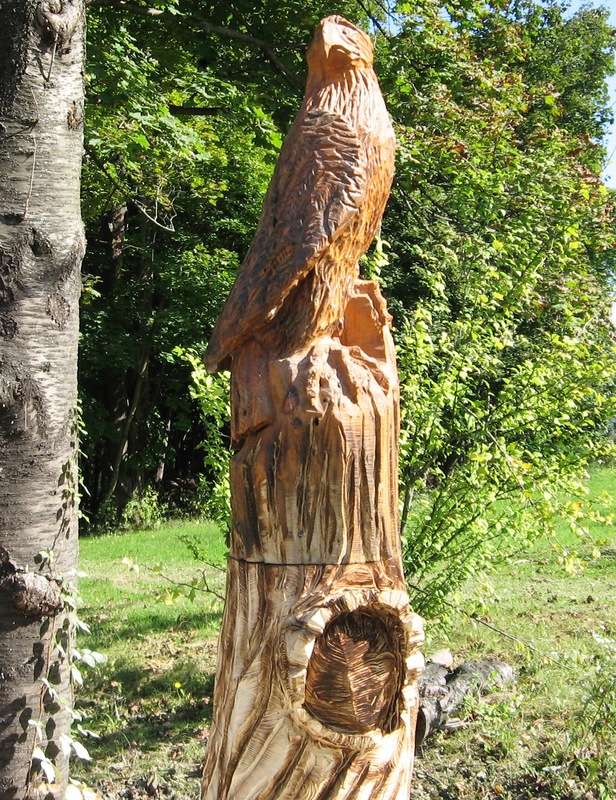 The eagle was across the yard, was watching Heilman as he carved out the bears. 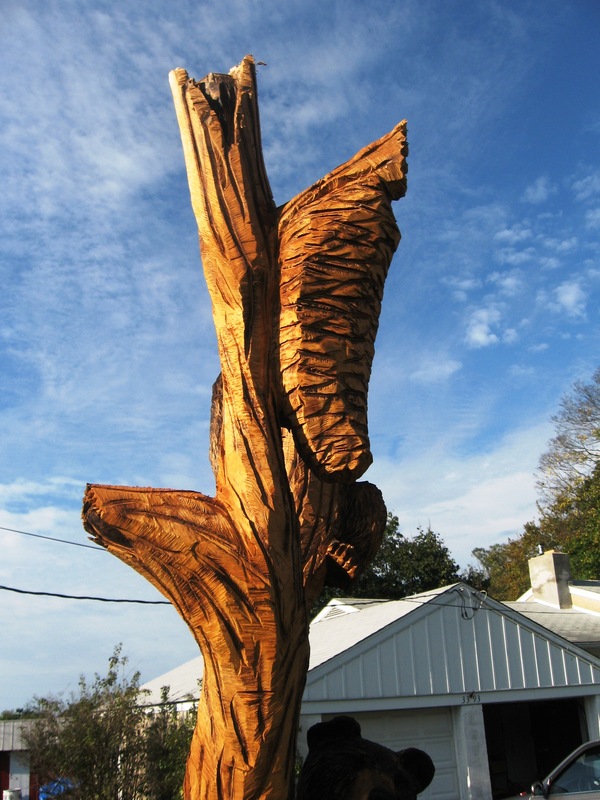 The Eagle was a separate piece, attached to match with the stump. 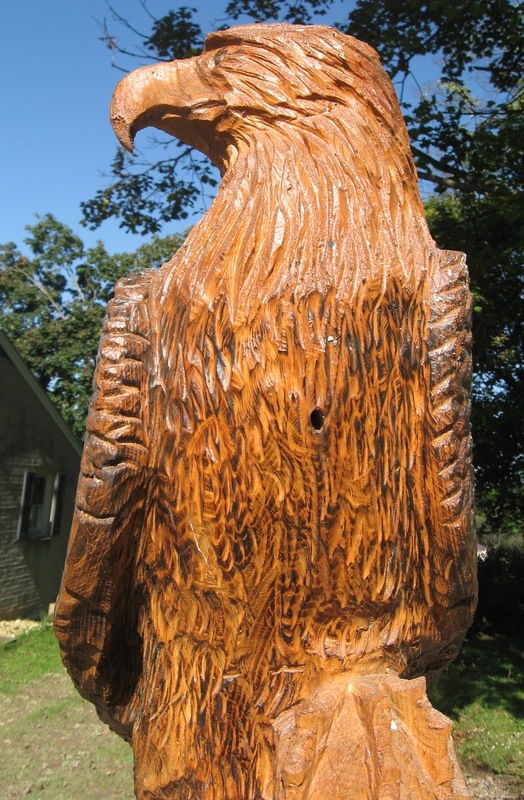 The Eagle was created at Heilman’s house. 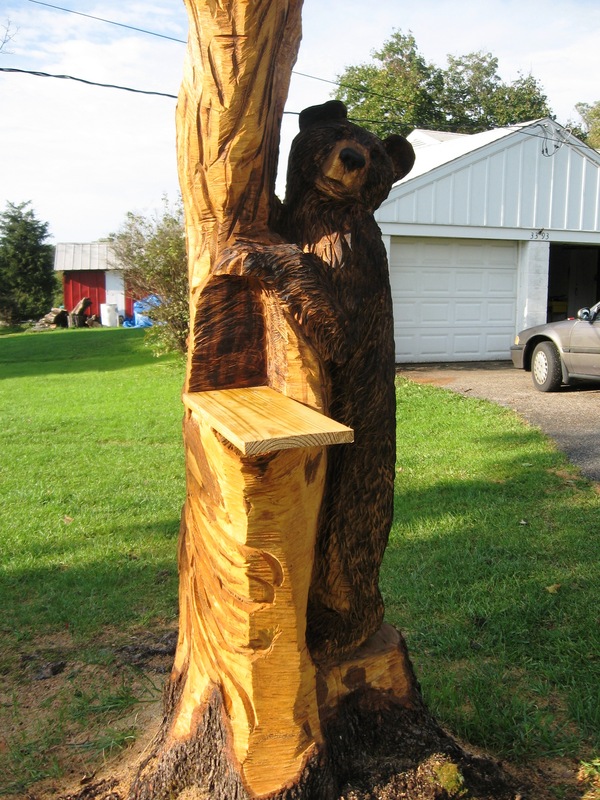 He has statues in front of his home for sale and as attachments for use on job sites. 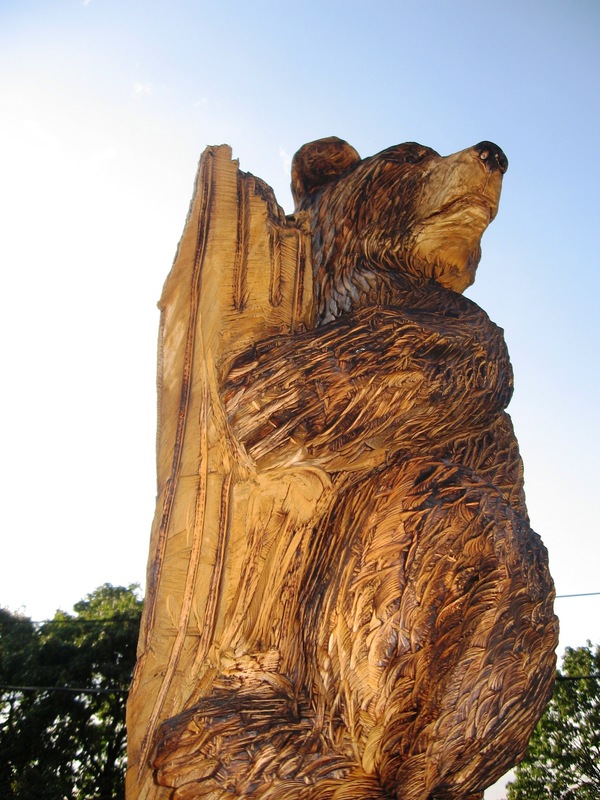 Back at the bears, I saw the beehive develop from very raw to a more finished edge. 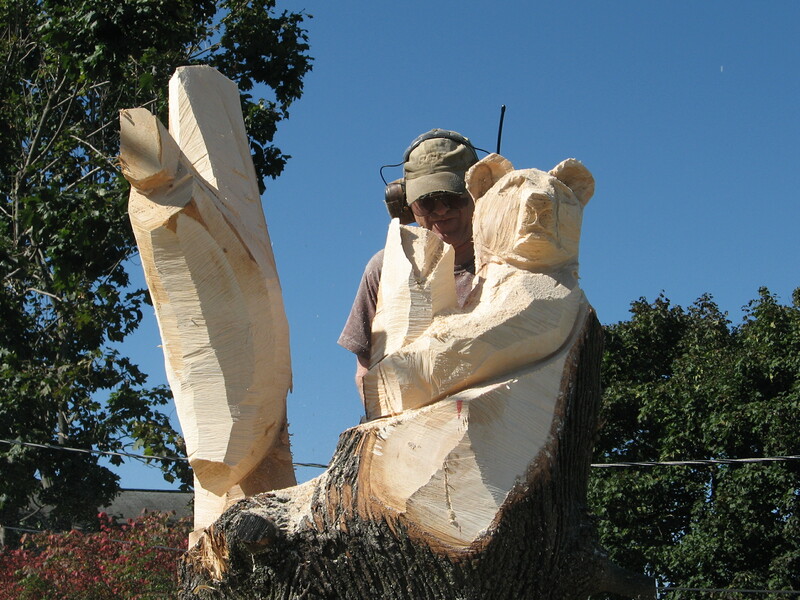 I found it amazing he could create these sculptures with no sketches and just taking a break after 45 minute to step back and see where he’s at with the stump. Once he gets an idea in his head he just dives in. 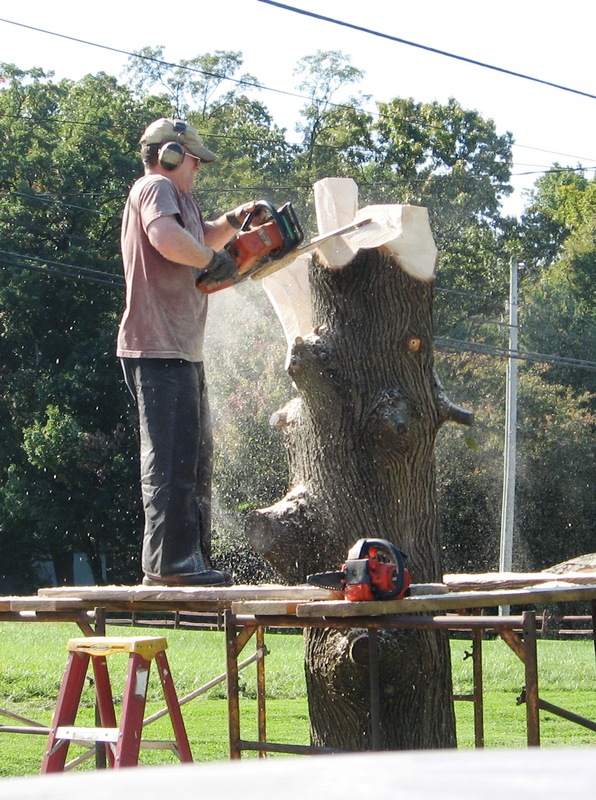 With 10 to 11 Stihl chainsaws on hand, he has no shortage of cutting edges. 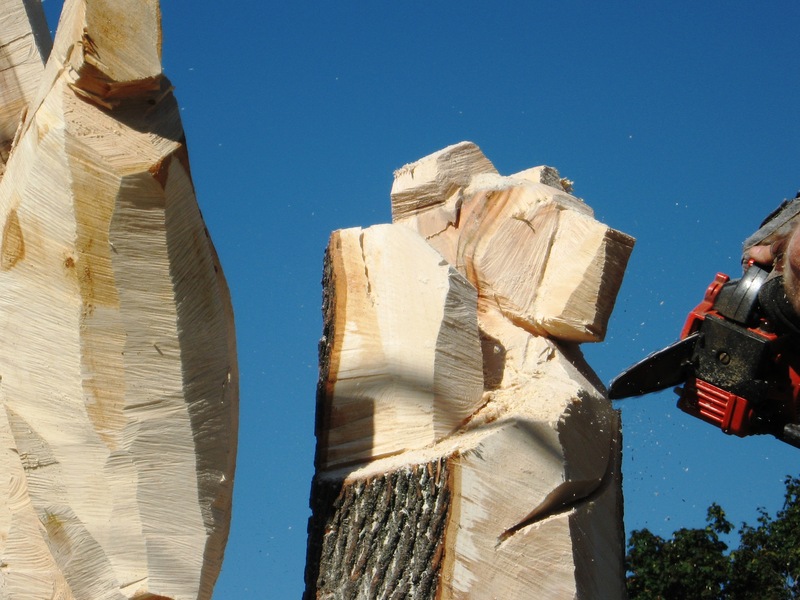 He carved the large chunks out, then broke out the smaller saw to create texture and accurate depth. 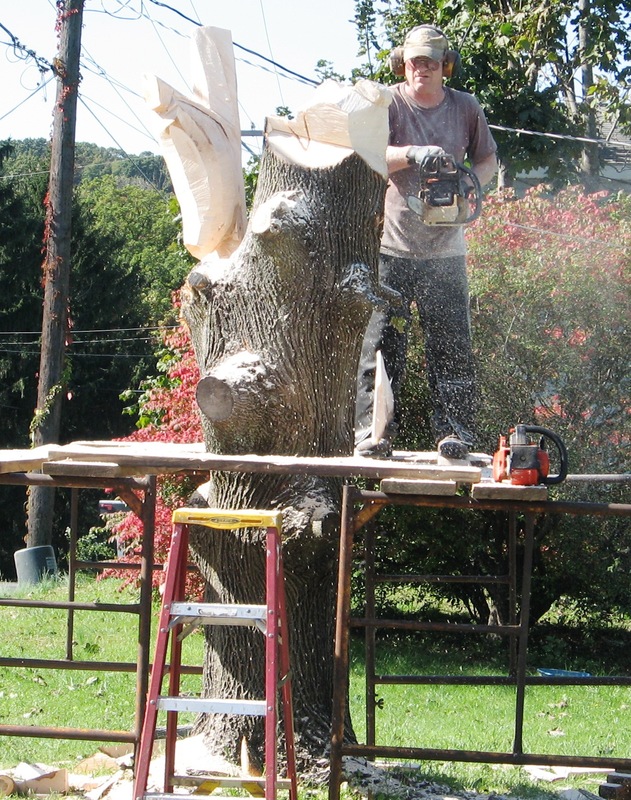 Heilman had a rhythm going, holding the chainsaw with either hand. Flipping it upside down and pulling up through the wood. Digging in with gusto as he wedged out bear’s body. Imagine what he could do with a laser. That wasn’t the type of boo-boo I meant. I went over to the emerging bear and saw that blood was dipped down the front of him. “Damn! You bleed for your art!” Heilman liked that thought. Just as it’s only a little blood, I suppose. Heilman gave me permission to climb on the scaffolding so I could get better shots. 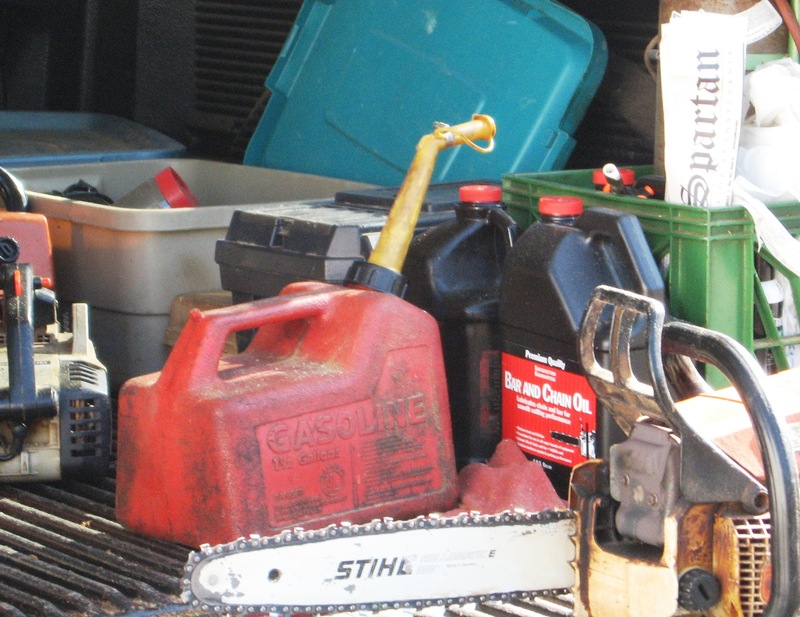 While Heilman had been busy creating, I placed a gift for him in the back of his truck. Notice “The Spartan” tucked into the milk crate? Attending to his cut, Heilman mentioned he would love to carve a Spartan for York College of PA. 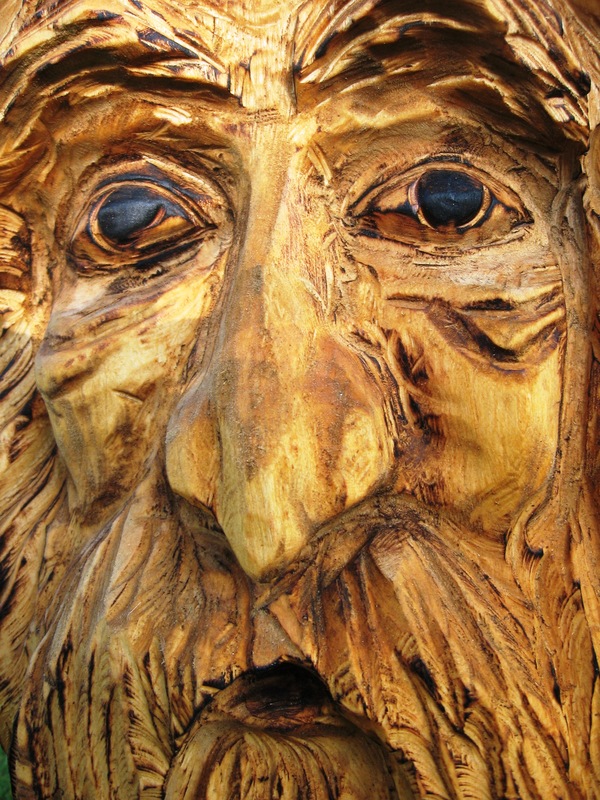 I wonder if there are any trees on campus that need a facelift? Heilman called it a day and I said goodbye. I promised to come back for pictures when he finished. He suggested talking to the owners of the property. He said, “They’re really nice people.” I thanked him again and was back on the road. I returned to the Rosengrant property eager to see the finished sculptures. 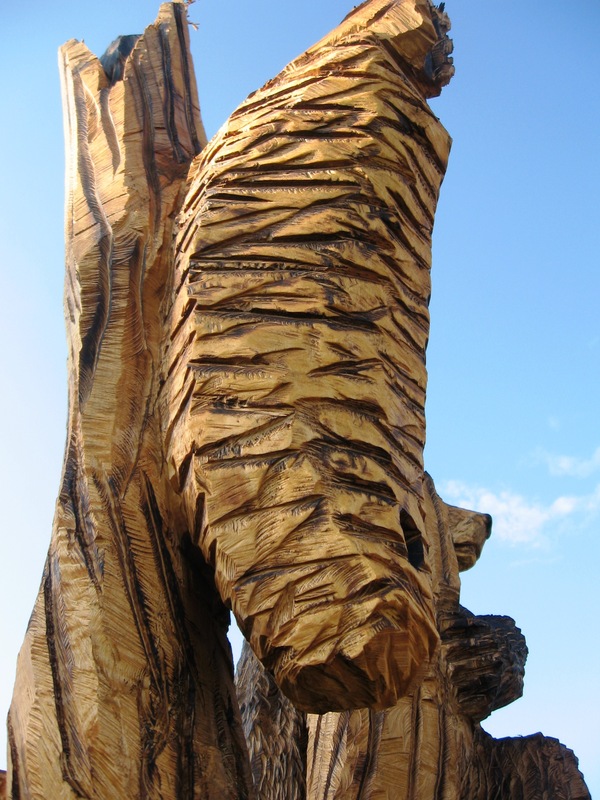 The transformation of tree trunk into art is stunning. Just driving by doesn’t do the carving justice. David Rosengrant was home and happy to talk about his statues. I introduced myself while thinking Rosengrant looked familiar to me. 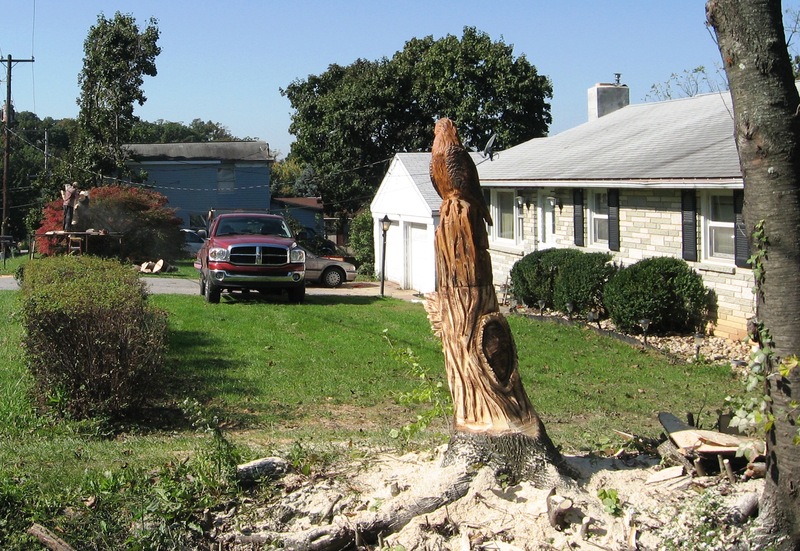 “What made you decide to have tree sculptures in your yard?” I asked. “Will you be using this as a mailbox?” I asked. What’s not to love? Beautiful art to share with anyone driving by on Druck Valley Road. The Eagle stands alone, watching over the bears. One bear returns the eagles gaze. Where is the face daughter Nicole wanted? Brad added “The Man of the Woods” last, making everyone happy. 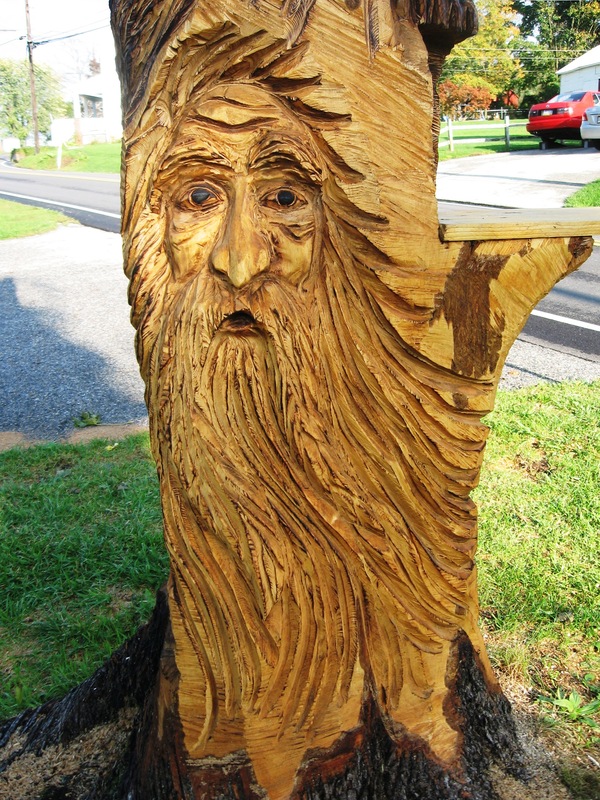 Interested in wood sculptures in your yard? Contact Brad Heilman at 717-266-5780. 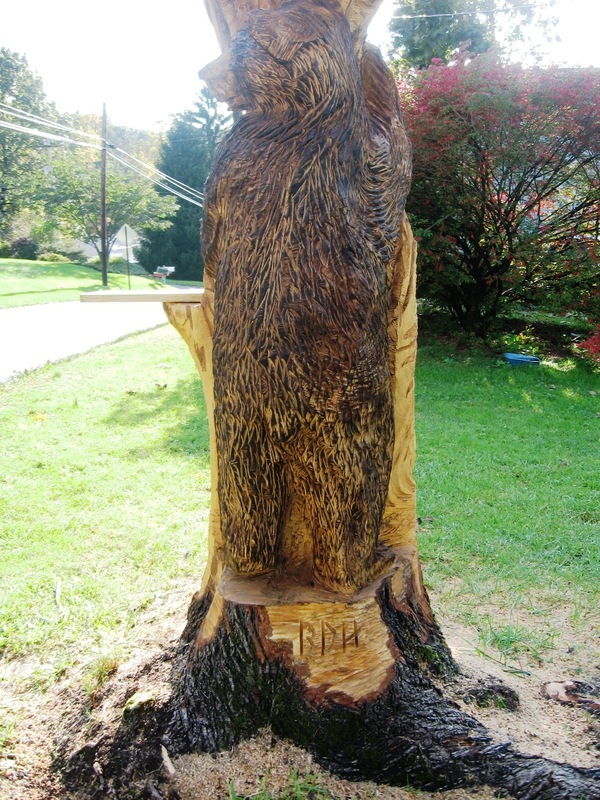 Expert Chainsaw Carver at your service. Thanks all for viewing my blog on this fascinating art form. That’s so interesting! Was he excited when you told him you’d blog about his art? 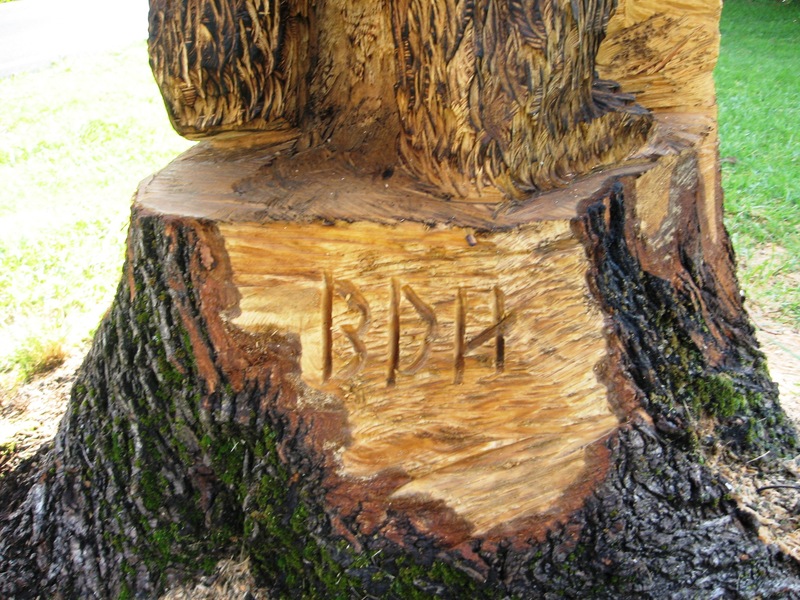 Yes, both the artist Brad Heilman and the ownr David Rosengrant were happy to hear I would be writing about the carvings. I figured why Rosengrant looked familiar. He is John’s first wife’s brother. Small world! ~P. Would u mind sharing Brad’s info. 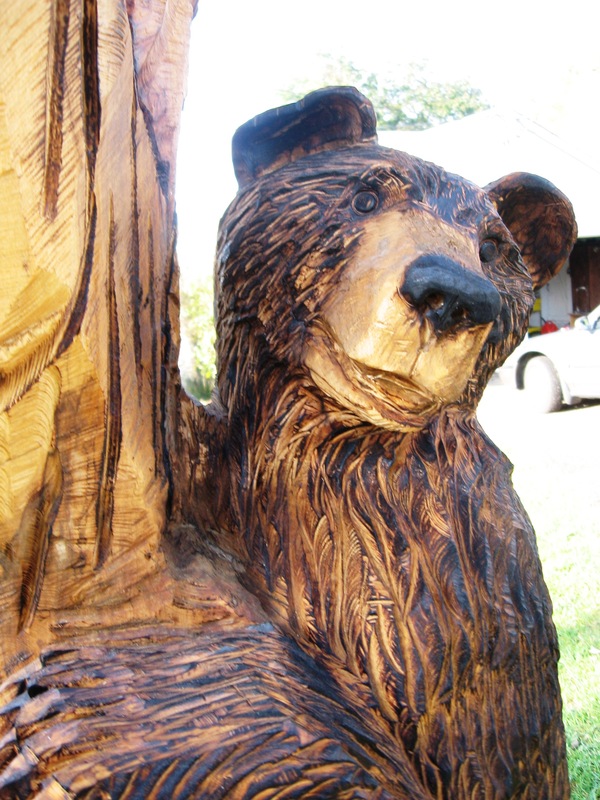 I would love to have a carving done!! !